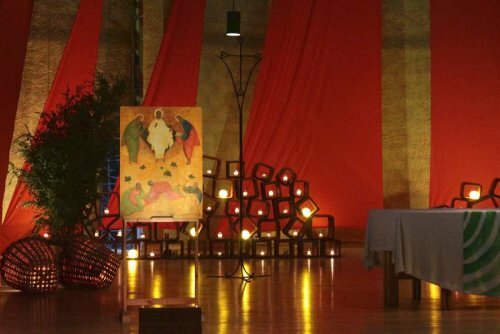 For most of you, the stay here in Taizé only lasts a week. For us brothers, for the sisters, for the young volunteers, this week is in the middle of the summer meetings on the hill; we are half way through this beautiful summer. For us it is a great joy to welcome you and to be together with so many people week after week. If there is a nice atmosphere of joy on the hill, we do not forget that everyone also comes with questions, a difficulty in their life, a worry. The suffering can be visible; it is sometimes hidden from others. In common prayer we support each other, so that the trust that comes from God gives us the necessary strength. This week offers a special way to refresh our strength. This Sunday, August 6, we will celebrate a feast to which we, the brothers, are very attached. At first glance this feast probably does not mean much to some of you. That is why I would like to say a few words about it this evening. It is the feast of the transfiguration of Jesus. On Sunday morning, we shall read in the Gospel the story of this event. You can also see an image by looking at the icon that is placed in the front of the church, near the altar. One day, Jesus went up a mountain to pray and he took with him three of his disciples, Peter, James and John. At that time, his disciples were disconcerted because, a few days earlier, Jesus had told them that he was going to suffer and be put to death. Were all the hopes they had placed in him going to be disappointed? And now, on the mountain called Mount Tabor, something extraordinary happened. As Jesus prayed, his face changed, the disciples saw him in indescribable light. And they heard a voice from heaven saying, "This is my beloved Son." In fact, the disciples suddenly saw who Jesus really was. The one with whom they had lived for three years, the one who was humble and who was about to go to the extreme of suffering, that very same person now was radiating the light of God in front of them. He was transfigured. The disciples discovered that he lived in a mysterious familiarity and closeness with God. For a brief moment, the disciples saw with their eyes that, in the poor and vulnerable Jesus, the light of the resurrection was already shining. They could then find anew the hope that they had placed in him and that had been shaken. How does this event speak to us today? Jesus invites us all to accompany him for a moment with his disciples on Mount Tabor. There, on the mountain, through his transfiguration, he not only lets us see that he is himself is filled with God’s light, but he also allows us to sense that he wants to share this light with us. Peter was one of the disciples who accompanied Jesus on the mountain. Peter left a letter, and in this letter he said, "You do well to look at Jesus like a lamp shining in a dark place, until the day begins to dawn and the morning star rises in your hearts. Looking at Jesus transfigured, a light that shines in the darkness, we understand that to be a Christian means allowing ourselves to be transfigured by this light, by the love of God. It is he who will permit us to become like him, by prayer and also by life. Even the personal shortcomings we come up against, even the trials of life we know, even the darkness that sometimes invades our hearts, can all contribute to this transfiguration. This is because we follow this Jesus who, having known human weakness and suffering, was also transfigured and resurrected. When, in prayer, we look towards the light of the transfigured Christ, it comes to dwell within our hearts. God tells us that we too are his beloved children, he says this to each and every one of us, he tells it to every human being on earth. I would like to express our gratitude to the Eastern Christians who are here, from Belarus, Russia, Ukraine, Romania, Greece and Serbia. The feast of the transfiguration of Christ was begun in the East. It was in the East that contemplative prayer in the presence of Christ transfigured on Mount Tabor was developed. It is so important for the Christians of the West to open themselves more to these treasures from the East. Brother Roger was very attentive to this. He placed a great emphasis on this feast of August 6, wanting to emphasize the possibility that God offers us to participate in the transfiguration of Christ. One day he wrote this prayer: "Holy Spirit, you know our frailties, but you come to transfigure our hearts, so that our darknesses themselves can become inner light." One last word about the feast of transfiguration: it does not only lead us to remain personally before God, it also stimulates a prayer for others and for the world: Christ is the light of the world, we pray that his light may reach all human beings, comfort all sadness, soothe all suffering. We are delighted to welcome, tonight and tomorrow, a visit by a cardinal from Rome, one of the collaborators of our beloved Pope Francis, Cardinal Coccopalmerio. I also greet another Italian bishop, Bishop Ricchiuti, who came with 150 young people from Altamura, and Bishop Ruben, who arrived from afar, from Puerto Rico. Last Sunday they met the Anglican Archbishop of York, John Sentamu, who spent last week with us. And we are delighted that we shall receive, on Saturday, for a few days, Pastor Larry Miller, who is the head of the World Christian Forum, which brings together the most diverse Christians, from Orthodox to Evangelical and Pentecostal. My name is Ana Perla, I’m 26 years old. I come from El Salvador in Central America. I belong to a youth pastoral institute. I also work as a professor of economics at the University of Central America, where 28 years ago the national army murdered six Jesuits and two women during the armed conflict that ended in 1992. Today the country is experiencing a situation of violence and poverty, especially on the outskirts of cities, and this causes the phenomenon of migration. Despite all the social problems accentuated by the political conflict, El Salvador is one of the happiest countries in the world. Currently I am part of the youth ministry of the archdiocese of San Salvador and I coordinate a deanery located in places with high level of violence among young people. This makes pastoral work difficult. For example, young people from several parishes cannot be brought together because they come from areas controlled by different violent groups that prevent entry to those who do not originate from their area. Entering the Church becomes one of the few ways to prevent young people from belonging to such groups. I hope that, on the basis of faith, many young people can make sense of their lives. Through a process of life-formation called "Walking with Jesus", promoted by the youth ministry, we accompany young people towards a personal encounter with God, reconciliation and the construction of a life-project that corresponds to the human beings they would like to become, so that, from their life-witness, they may be missionaries to other young people and take part in the transformation of society. At the grave, the angel said to the women: Do not be afraid. I know that you are looking for Jesus who was crucified. He is not here; he has risen, just as he said.